If you’ve read my earlier posting about using kiwifax.py for receiving radiofax via KiwiSDRs, then you would be familiar with the process of obtaining and using the kiwiclient set of tools. 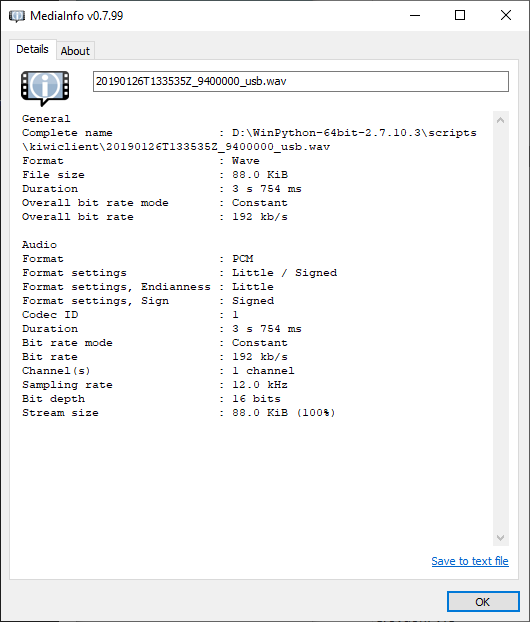 To use it, you will need a working Python 2.x installation and numpy – under Windows, it’s easiest to use WinPython 2.7.10.3 in my experience. -u <username> to login to the receiver with – it’s good courtesy to let others know who you are! -p <port number> of the KiwiSDR you’re trying to use. For example, recently I was receiving Shortwave Radiogram from VK6QS in Collie, Western Australia which has a known 20 minute inactivity timeout that causes problems. No problems today – not with kiwirecorder.py as it isn’t affected by the inactivity timeout. It will, however, lose connection and keep retrying to connect in the case of hitting the daily limit, so use with care and use responsibly! Interactively, the script prints out block numbers and RSSI as it is recording. To end the recording, kill the process using Crtl+C. You can use the system to automate recordings by invoking the command on a schedule and you could possibly be saving some data as well as it won’t be pulling down user stats/waterfall data if all you want is just the recording. By default, a reception in USB results in a 16-bit mono .WAV audio file sampled at 12kHz. In other modes (e.g. I-Q), this will differ. There is also the kiwi-wav mode which is useful for TDoA uses as it preserves GPS timestamps but could cause incompatibilities with some players/audio editors. kiwirecorder.py is another powerful part of the kiwiclient package which makes automating recordings and overcoming the inactivity time-out possible. It is relatively simple to use, as long as you are comfortable with the command line/console, and extremely powerful. Use it responsibly and it will make your “monitoring” life easier. While the inactivity timeout can serve a purpose, for those who want to avoid users monopolizing the SDR, it’s probably better to set a “daily limit” instead. At least, with the daily limit, users get a clear indication of how long we have left and using kiwirecorder.py or any other tool won’t allow you to evade this limit. The downside is potentially having problems with users who might be sharing a single IP address also sharing a single daily limit … unfortunately, there is no perfect solution. I encourage users to use these tools with care in a responsible manner. I’d also encourage users to set their username especially when using these tools as part of being a “good citizen”. This entry was posted in Computing and tagged radio, rf, sdr. Bookmark the permalink.